One thing I love to do is watch movies. I’ve been a Netflix member since 2001 and try to review each movie and share my favorites with friends. While there have been tons of cables, adapters and file converters to get your videos and movies to play on your television, nothing has every really been as easy as this new stereo I found through Netflix. 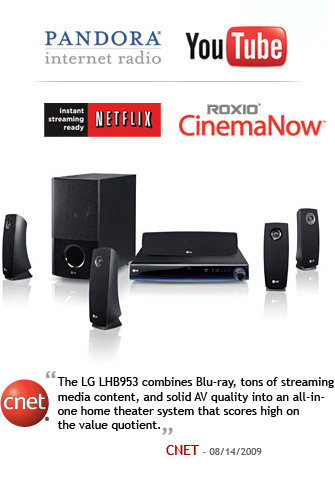 The LG LHB953 is an integrated home theater system that plays Blu-Ray DVDs, streams Netflix movies from your Instant Queue, includes a charging and docking station to view your videos, pics or music from your iPod or iPhone, links to your Pandora radio profile of favorite stations, access to rental and purchase of CinemaNow movies and television plus access to YouTube including your favorites. This little gem is perfect for the big screen TV in your house that everyone can gather around and view some of the online videos that normally would have everyone huddled around a monitor in the home office. Think of the surround sound you already have. Now think of the next party you host that will now be accompanied by your favorite Pandora station over your existing HD audio speakers! Now that is a party! Some of you have heard about the XBox or Playstation systems with access to Netflix but this systems does so much more! While the game systems may be great for the kids room or the game room, the LG systems are for the main room for everyone to enjoy… or maybe just for us movie lovers with a big screen and no one to fight over the remote! Previous Suffer from Migraines, Insomnia, Seasonal disorders or PMS?